“The background is a pale blue sky with white clouds. 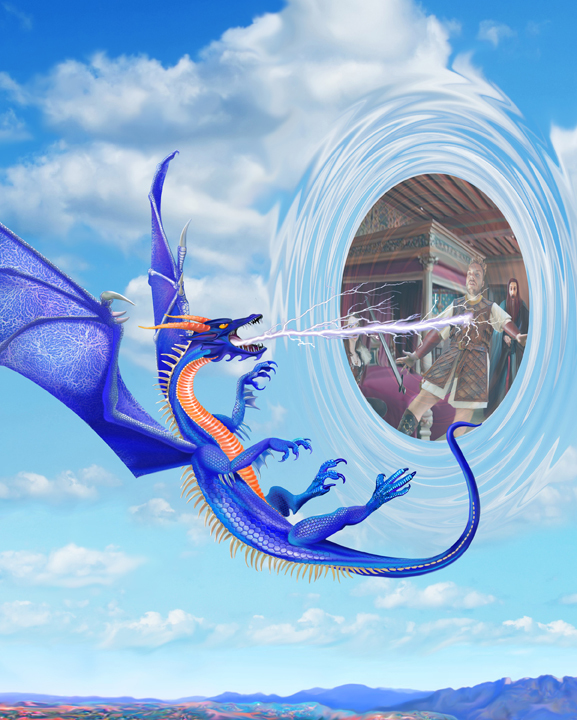 There is a turning young male blue dragon that is using his lightning breath weapon upon a typical D&D party who are looking out from a floating oval portal that is suspended in the sky. This entry was posted in New Illustrations and tagged blue dragon, darlene, dragon, dragon commission, Fireside Creations on January 28, 2018 by Darlene. I like it, particularly the look of startlement on the face of the leading character, he seems to be much more than simply surprised, I might even say “shocked”. For the characters and such of the room as can be seen through the portal, did you use photographic reference(s)? I am asking because of the slight tonality difference inside and outside of the portal, some of it being because of indoor vs outdoor environments of course, but there seems to be a differential depth of focus that you may have had while working on the piece, one that is actually pretty neat. The draconid “pops” out against either the portal or the vast space behind it, and has a small degree of almost a heraldic stylization to it’s form, one that almost murmurs “There are different rules here…”. Actually, just while writing this I figured it out: the “magic user” that the party in the description would have had to be turning even while entering the portal (effectively already almost turned so as to be throwing themselves backward) in order to get that snap (crackle, and pop) shot off without having to do a long turn back around or come back climbing hard. I can run it pretty clearly in my mind as a cinematic sequence, and it would be pretty quick and take some deft video editing to convey properly to viewers, and I suspect that Would in large part explain why the client wanted to commorate the scene. Has the customer already taken delivery, or would it be possible to see high resolution close ups of select portions of the picture? Thanks, Darryl, for your thoughtful comments. The artwork was delivered to the client in July, 2017. They intended it as a cover, which is why there is so much sky overhead. If you want to see the art up close, you will have to contact Fireside Creations, llc (Eddie Jonas / Stephen Lee).